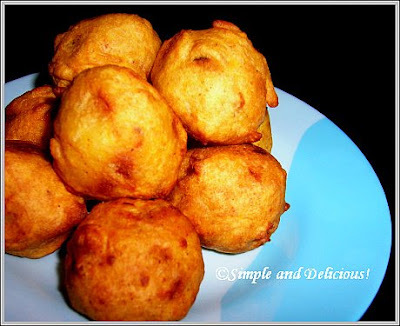 Potato Bonda | Simple and Delicious ! Make a medium thick batter using the above ingredients. Boil and peel potatoes.Mash them. Chop onion , green chillies and ginger. Heat oil and splutter mustard seeds. Saute onion, green chillies,and ginger .Add curry leaves, coriander leaves and turmeric powder. Mix this with mashed potatoes and salt. Make small balls and dip them in the besan batter. Deep fry. Submitted to" Ode to potato" hosted by Monsoon spice..
Seena I am truly going to try this recipe as soon as I get some more gram flour in as I have run out. They look WONDERFUL! You are an amazing Kerala chef! These are always a favourite and a big hit. Thats a lovely potato bonda seena. Nice Entry. Aloo Bonda are my fav! I can have atleast 8 of them in one go :-) Love them a loooooooooooooot!! They look so yummy. These bondas look very delicious. I love these bondas. In maharashtra we call it' Batata Wada'. You can have this bonda with Pav. Make 2 halves of pav, apply some chutney and place bonda in between 2 halves. Bondas look awesome! It's been so long since I had them. this recipe rocks and these bondas so lovely. This is a filling tea time snack seena! Looks perfect! Yum,Yum and YUM!!!!! I like potato so much. How nice your Potato bonda recipes. this is such a nice and interesting recipe. I ve never heard of it before but sounds delicious. ooooooooh! my mouth is watering. Can't wait to try it. I am having a tea party at my house this Sunday so i ll make this day! What lovely timing. thank you for shearing your post.